Enjoy Utah! : Do Go Chasing Waterfalls! It's time to get that last hike of the season in before the snow flies. Right now the leaves are at their reddest and the mountains are more beautiful than at any other time of the year. What better hiking destination than a waterfall? The Wasatch Front has plenty to choose from and most are kid friendly for even the tiniest tots. Try Ghost Falls near Draper, Grotto Falls near Payson, Battle Creek Falls near Pleasant Grove, Donut Falls near Salt Lake City, Cascade Springs near American Fork, Bridal Veil Falls near Orem, or Stewart Falls near Provo. (If we missed a waterfall please let us know in the comment section). For other great hikes and adventures at museums, picnics, and birdwatching, go to Utah Valley Family Adventures! Thanks! 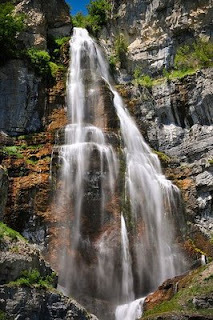 We will visit Bridal Veil Falls this weekend and will include a review on our website!